Over in Elvis Presley's Las Vegas home, the Hilton Hotel, Cyberlink is showing off its vision for the digital future. Updates to it's popular media suite software - which appears in OEM versions on Dell, Lenovo, BenQ and Sony Media Center PCs - include HD DVD and Blu-ray playback and authoring, as well as a brand new solution for receiving pay-per-view TV from a cable or satellite feed. It has also been working with partners on a Conditional Access Module (smart card reader) to enable the service. Cyberlink confirmed that an IPTV version of its software is under development. With even basic DVD playback not possible in Vista Home without separate software such as Cyberlink's PowerDVD, the company is in a strong position at the moment. Sports fans, though, are the real beneficiaries of Cyberlink's latest addition to the PowerDVD suite: MagicSports 3. 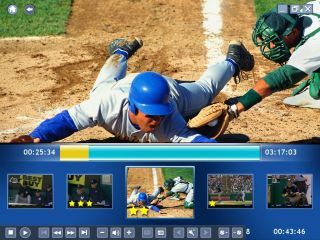 Available as a standalone product (retailing for about £35), and doubling up as a Media Center plug-in, MagicSports 3 will analyse a sports recording and create scene breaks at pertinent places - picking out the highlights of the game for you so you don't have to sit through the whole thing. One for cricket fans who can't bear to watch the full extend of England's embarrassment, then.